The year 2012 is a turning point for the Cineteca di Bologna, almost fifty years after the creation of the Commissione Cinema, the organization that started it all: on January 1 the Cineteca became a foundation. We chose this new organizational form to make the best use of our resources, to seize dynamic work and research opportunities, and to establish the Cineteca as a leading institution in the field of film culture. Our mission that embraces the past and is open to the future remains unchanged: the Fondazione Cineteca di Bologna is a place for archival conservation and restoration, film and audiovisual promotion and dissemination, training, research, and publishing. A multifaceted mission, a Cineteca ready for all the challenges of conserving and promoting the moving image in an era of immense technological, aesthetic and social change. If the past is alive, then it too has a future. Recovering films from the past and discovering their connections with the present were the inspiration behind the creation of the Commissione Cinema in 1963, which led to the founding of the municipal institution the Cineteca di Bologna. Cineteca di Bologna encompasses archives, libraries, exhibitions, workshops, cinemas and offices. 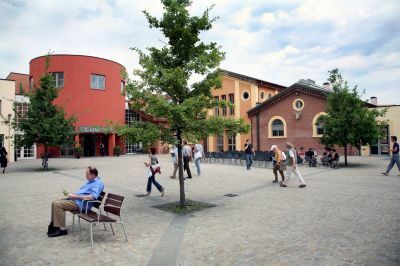 With the inauguration of its new location in Via Riva di Reno in the summer of 2000, the Cineteca began the process of creating an audio-visual paradise, and by June 28, 2003 a large part of its activities was moved to the site of a former slaughterhouse. Located in the city’s most dynamic quarter, the Cineteca benefits from a close relationship with the nearby MAMBO museum of modern art and Bologna University’s Performing Arts and Communication Sciences departments.